I once whipped through it in 68 seconds. Not a record, not even a max score, but pretty good. It was the only physical test I didn't get a max score on. I always blamed it on that damn wall. It is just too tall for short people. Most obstacles are easier if you're taller. I ran the obstacle course again yesterday, twenty years after my first time. I didn't think it would be so hard. The o-course is a skill and requires a lot of practice, still I didn't think I would be as challenged as I was. Everything was so much bigger, the grips on the bars thicker, the rails further apart than I remembered. I didn't expect to match my previous best score, but I didn't think I would feel so clumsy and nervous. This o-course, unlike the one at Officer Candidate School, is tucked away in a small clearing, near some heavily trafficked roads, screened by trees and undergrowth on all sides. It's a patch of nowhere near somewhere. I jogged to the clearing wearing my utility trousers and boots, and strode to the starting point. The first obstacle is really just a starting line in the form of a log mounted two feet up. 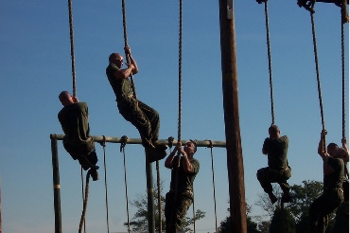 The first real obstacle is a bar seven or eight feet up. You have to get over the bar. A strong man can jump up and flip himself over in one fluid motion. I'm not that strong anymore. I have to do it the slow way. I continued on, through all the obstacles, the combination, the double bar, the cursed wall, the high hurdles, and the rope climb. I didn't hurry. I couldn't hurry. I barely made it. I made it. It took me about ten minutes and I was exhausted. Proud, exhausted. Feeling rejuvenated. Knowing that feeling rejuvenated only meant that there is a reason I needed rejuvenation. After proving to myself that I am indeed getting old, I began walking back to my car and stopped at another clearing. It was so peaceful looking. A deer was lying down in the middle of the glade about 20 yards away, seeing me, completely ignoring me, and another, more suspicious deer was at the right side of the clearing. He stopped and watched me. At the far edge of the clearing were two woodchucks. Fat and oblivious to my presence, they munched on the plants, ignoring me walking by. 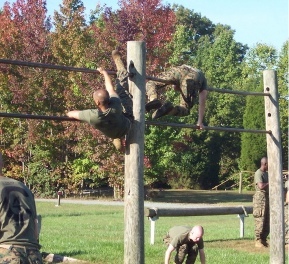 I sat down and watched them for about twenty minutes, twice the time I took to run through the Marines' gauntlet of obstacles. Watching the woodchucks waddle. Daring the deer to keep dining, making the suspicious one stop and glance nervously at me everytime I so much as scratched my nose. I waited and waited for them to run away, wanting to see their nimble jumps through the underbrush, over and under obstacles like I once did. I couldn't find it in me to make them leave by frightening them. They looked so peaceful. The suspicious deer after a while slowly walked to the center of the glade and stood over his friend. Did he feel responsible for protecting her? Was it a female? I don't know enough about deer to know that. I don't think the males grow antlers this time of year. They were friends. I don't know that there is any significance to these fauna in the glade as I finished the o-course. I enjoyed seeing them, in peace, with no predators to fear. Would that we could all live that way. But we can't. 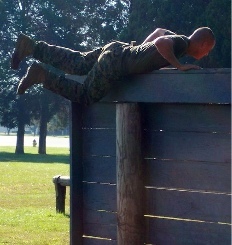 So I will keep training and getting better at the obstacle course and learning my trade. I will still take the time to enjoy what peacefulness I can find, when I can find it. Either alone, or with those that I love. And keep training so that we avoid obstacles to peace in our land. I have to get my digs in on John Kerry now. If he is elected, he will be my commander-in-chief and I will no longer be legally allowed to share in the inevitable discussions of his perfidies, treason, and goal for a Soviet America. In one of his less guarded moments, which aren't too infrequent, he let slip his real perspective on the war we are now waging against Islam. He said that terror is a problem now, but it can never be eradicated, much like gambling or prostitution. His choice of comparisons is peculiar, but is consistent with being a former (and undistinguished) prosecutor, and is consistent with his being a current (and especially undistinguished) senator. From both backgrounds he comes to think of gambling and prostitution as crimes. Legally these may well be codified as crimes in some places, but they are hardly dangerous. That gambling and prostitution continue to exist despite being illegal is little harm to the safety of our nation, and mostly it is the fact that they have been codified as illegal that makes them dangerous to anyone at all. Only because gambling and prostitution are illegal has anyone resorted to violence in support of those trades. It's strange that these are the crimes that Kerry used to compare to terrorism. Why didn't he say that terrorism will never be eradicated much like burglary or murder? It's just as true, but no one would suggest that we just accept those crimes as our inevitable fate. The reason is that John Kerry is not a human being with any sense of morality or decency. He thinks that melting skyscrapers with thousands of people inside is just another day in the life of America, our just desserts for being American. Just as Jimmy Carter, in his urine soaked slippers, thinks that taking American hostages is just a result of our failure to understand the Muslims, John Kerry thinks that sawing the heads off of living people as they scream in pain and gurgle and spit up their own blood, is just a cultural phenomenon that we must accept in our lives. The lifeless gaze of their heads sitting on top of their backs is just the same as two guys betting on the Red Sox. Murdering multitudes by igniting thousands of gallons of jet fuel violently inserted into a skyscraper is the same as pulling a lever in Las Vegas and hoping for three oranges to show up. The Soviet faction of the Democratic party is now firmly in control of the left half of our nation. If we elect John Kerry, it will be an act of self-immolation. If he holds the reins of our foreign policy, we can count on thousands more innocent Americans being massacred.